Docent Dialogue: What Does a Docent Do? We’ve already profiled one of our illustrious docents, but today we’re looking a bit more closely at what it is that a docent actually does. The word “docent” comes from the Latin docere, meaning “to teach.” Google the word, and that is what you will find on almost any website dedicated to docents, but we’re not here to talk dictionary definitions. What do docents mean to FWMoA and the community we serve? Drawing of Peter Bremers’ Icebergs and Paraphernalia 219 by a 2nd grader from Harris Elementary. We occasionally get mail from schools who visit the museum (and we LOVE it—keep it coming!). The drawing above came in a packet of written and drawn student responses that I received over a year ago, and it’s been hanging in my office ever since. While this second grader took some artistic liberties with the details of her drawing (our floors are unfortunately not magenta), if you’ve visited FWMoA, you may recognize Peter Bremers’ pink cast glass sculpture, now installed just past the atrium. Notice the little bubbles within it? Many of our young visitors see the bubbles in the glass and ask what’s inside—soda? Hand sanitizer? Jello? Nope, just air bubbles trapped in the glass! We see here the magic this student experienced in viewing that work of art. This group of kids is reacting, engaging (look at their eyes! ), and making connections. This student clearly had a positive experience at the museum, and that is thanks to their docent. 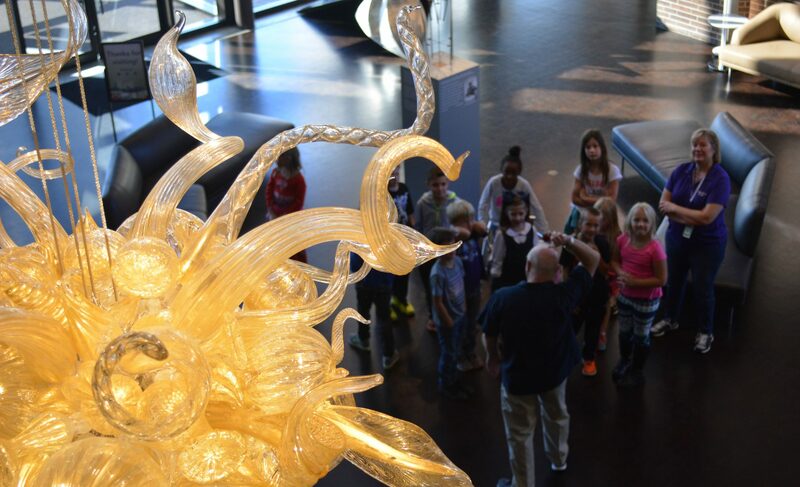 When a school group visits the museum, we hope to impart some information about the artwork on display, maybe something about the artist, the historical context, or the process used to create it. What we really hope they learn, though, are behaviors and skills. They should leave the museum feeling comfortably equipped to engage with objects—in some way—on their own, and also knowing that the museum is a place for them and their families to visit again and again. Stopped in front of Peter Bremers’ Icebergs and Paraphernalia 219, Docent Michael Green leads a conversation with his school group tour. Photographed by Alyssa Dumire. Let’s look a little closer at that Peter Bremers sculpture, Icebergs and Paraphernalia 219 (more of Bremers’ work can be seen through September 23 during the Glass International). Imagine you’re part of a tour group. Your docent might ask any of the following questions: What shapes do you notice? Although we can’t actually touch the work on display, how do you think you would describe the texture if we could? Does it remind you of anything? What do you think the artist might have been thinking about when he created it? Does the title give us any clues? Why do you think he chose to create this piece from glass rather than another material like stone or metal? Is the way it’s displayed part of the artwork? Would you display it differently in your home? I also encourage students to look closely (but not too close, note the boy pictured above with his hands behind his back so he isn’t tempted to touch the work!) and notice that way down at the bottom, Peter Bremers scratched his name into the glass to sign his work. Why is it important to sign our work? These questions are simple—anyone can answer them! But they’re designed to get visitors looking and engaging with the work, spending more than the typical 7 seconds to look a little deeper and make connections with what they see. The way docents build on student responses to these questions is important, too, and is one of the skills we work on most during training. A good tour is really a good conversation about selected artworks, in which some information is woven to tell the story of the artwork on display. We also know that some of that information sticks! In that same packet of student letters, students wrote that they learned about Impressionism, which, thanks to their teachers, was also spelled correctly. Want to learn more about why we do what we do? Here in the Children’s Education Department, we’re pretty excited to learn more about the AAMD-NAEA Study on the Impact of Museum Programs, which examines the effects of single-visit, inquiry-based museum experiences on a variety of student capacities. Want to join us as a docent? Check out Joan Bovee’s interview to meet one of our current docents and feel free to get in touch with Director of Children’s Education Alyssa Dumire for more information!